Built in 1871, the single-span Fallasburg Bridge crosses the Flat River five miles north of Lowell. Although it’s served travelers for more than 125 years, it’s just the newest in a series of wooden bridges at that site. The first was constructed across the Flat River around 1840. It, like others that followed, fell victim to high water and massive spring ice jams. Then Jared N. Bresee, a bridge builder in nearby Ada, was contracted to build the present structure. Completed at a cost of $1500, Fallasburg Bridge stretches 100 feet long and stands 14 feet wide and 12 feet high. Its lattice-work trusses are made of white pine timbers from nearby Greenville. The use of the “Brown” truss in this bridge and its two close neighbors, Ada Bridge and White’s Bridge, is unique to this area of Michigan. As with all covered bridges, the roof and siding protect the timbers from rot. The current roof is covered with cedar shake shingles. The original wooden abutments were replaced by lower concrete structures in 1905. In 1945 and again in 1994, the bridge was extensively repaired. Because the restorations were completed with conscientious attention to detail, the bridge has retained its historic integrity. 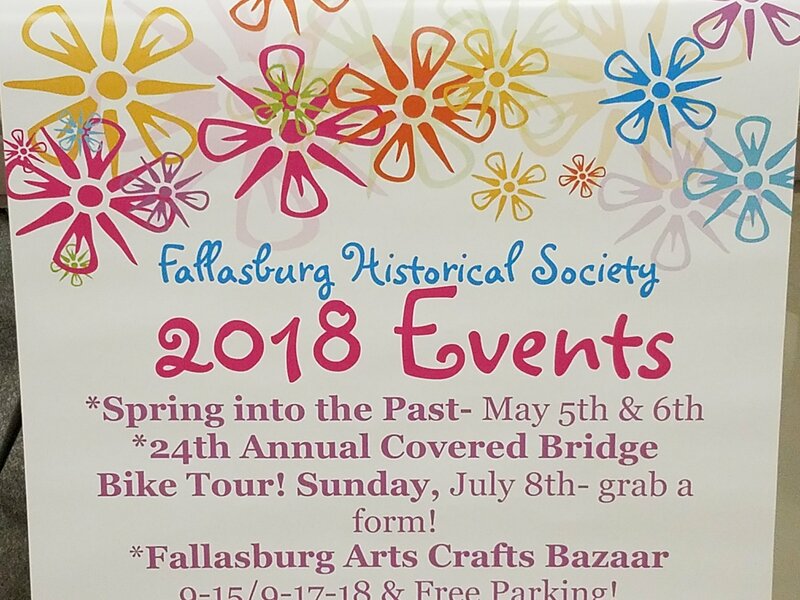 The picturesque setting of Fallasburg Park displays Fallasburg Covered Bridge to perfection. Its rural location and quality construction contributed to its survival during a time when old covered bridges were being destroyed to make way for new road construction. The Fallasburg Covered Bridge was listed with the Michigan State Register on February 12, 1959. It was awarded a Michigan Historical Marker on September 10, 1971 and was listed with the National Register on March 16, 1972. Directions: From Ada, follow M-21 to Lowell. Turn north on Hudson Street, which becomes Lincoln Lake Avenue. Turn east on Fallsburg County Park Road. Follow the signs. The 100 foot, single span Fallasburg Bridge crosses the Flat River five miles north of Lowell. The picturesque setting of Fallasburg Park displays one of Michigan’s oldest native covered bridges to perfection. The use of the Brown truss in this bridge and its two close neighbors, Ada and Whites is unique to this area of the state. John W. and Silas S. Fallass settled here in 1837, founding the village which soon became the main stage route from Ionia to Grand Rapids and boasted a chair factory, sawmill and gristmill. Around 1840 the first of several wooden bridges was placed across the Flat River, but all fell victim to high water and massive spring ice jams. Bridge builder Jared N. Bresee of Ada was given a contract in 1871 to build the present structure. Completed at a cost of $1500, the bridge has lattice work trusses made of white pine timbers. Repairs in 1905 and 1945 have kept the Fallasburg Bridge safe for traffic for more than one hundred twenty five years.